"Super"foods are substances that contain a lot of nutrition, in a very dense form. 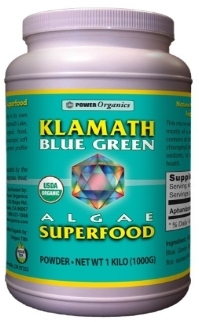 Blue Green Algae is "packed with beta-carotene and B-Complex, biologically active vitamins, enzymes, chlorophyll, fatty acids (DHA and EPA), neuropeptide precursors (peptides are joined amino acids), lipids (fats), carbohydrates, minerals, trace minerals, pigments and other essential growth factors." Shilajit contains all amino acids and over 85 minerals in ionic form, including humic acid and fulvic acid, which increases cellular absorption. You only need to take a very small amount of this dense super multi vitamin!bAn abundance of Phyto-Nutrients in Humic acid has even been shown to promote natural production of THC and CBD in the human body! Hemp contains many Essential Amino Acids, Vital Minerals, and Essential Fatty Acids, and Fiber. It can also be used to build and insulate structures, as clothing fabric, as bioplastic, and as fuel- AND I THINK THAT'S SUPER! Raw cacao contains more than 300 different chemical compounds. Protein, calcium, carotene, thiamin, riboflavin, magnesium, sulfur, flavonoids, essential fatty acids, and more. Medicinal Mushrooms contain many minerals and other compounds that have been shown to support immune system balance. Combine with cacao for synergistic benefits! Ghee is pure milk fat. Super butter! The absence of milk solids and water in ghee make it completely shelf stable. Ghee has one of the highest flash points (485ºF) which make this oil the best choice for high temperature cooking. Ghee is comprised of full spectrum short, medium and long chain fatty acids, both unsaturated and saturated. Ghee contains Omega 3 and Omega 9 essential fatty acids along with vitamins A, D, E and K. Ghee is one of the highest natural sources of CLA (Conjugated Linoleic Acid). Anti-oxidants and minerals are present in ghee. Ghee is used as a digestive aid, for energy, sexual vitality, skin and eye health, as a lubricant for the joints, and for alkalizing the blood. The assimilation of the nutrients increases when suspended in a ghee matrix. When you add spices to ghee to cook with the flavor is carried deep into the food. Many herbal preparations use ghee as the carrier oil because of these characteristics. Essential Oils contain herb and plant chemicals called terpenes. Many can be ingested, such as the oils of spices like black pepper, and have been shown to support a healthy balanced body! Learn more about Edible Essential Oils!